When my son first saw this, he called it taco cake. So I thought I would call it that. It is more of a taco corn bread. I am not going to lie, this recipe is in a Pampered Chef Cookbook. I haven't tried too many recipes from my Pampered chef cook book, but I knew I had to try the Tamale Round-About. 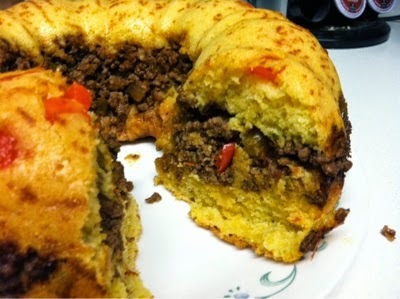 This Mexican based recipe is as good as the other famous Pampered Chef recipe, Taco Ring. I made this is my bundt pan. It is essentially corn bread with meat in the middle. My husband absolutely loved this. This recipe is on-line and can be found at thier official cite, here. It is Valentine's Day, so this dish could work out if you have a heart shaped baking dish...maybe..I don't own one, so I could not tell you for sure. This post is going to be shared with, Inspire Me Monday/Friendship Friday, Creative Friday, Friday Finds, Making Your Home Sing Monday, Masterpiece Monay, What'd Do This Weekend, TOO Cute Tuesday, Tuesday Table, The Gathering Spot, Full Plate Thursday, Best Of The Weekend, and Link Party Palooza. 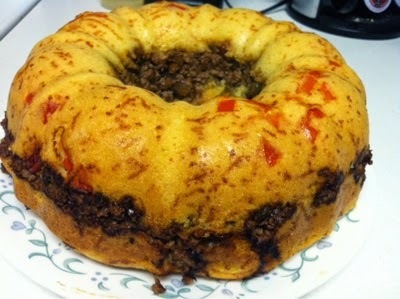 I just love your Taco Cake, thanks so much for sharing with Full Plate Thursday! Hope you will come back to see us real soon!